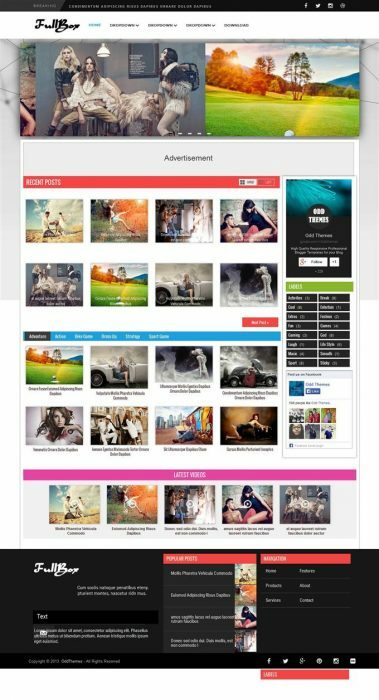 Hello everyone, Today we are going to share a great free high-quality 45 best magazine blogger templates. If you are a blogger, you might be eager to take the latest best free magazine blogger templates released on the net. Well design magazine blogger templates is super stylish, & at the same time it is 100% responsive, perfect quality, super elegant, premium design free Blogger Template ideal for magazine or News based blogs or web portable. Internet offers the vast collection of Magazine blogger templates for free to download. 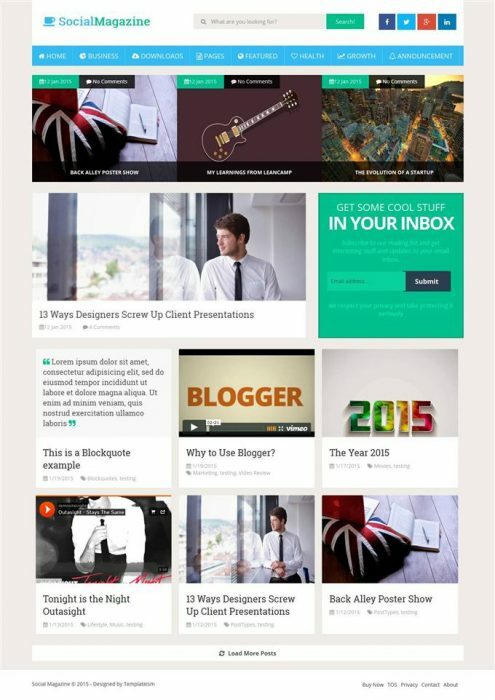 So here is the list of 45 best magazine blogger templates of 2015 take a look. Social Mag is a based on Modern UI with futuristic interface. With features that makes it social media friendly. You’ll find almost all key features on this template that are needed to run a blog or a magazine based site. Gagism is based on Futuristic UI build for images gags websites. We have put together an amazing CMS interface for all those gag loving people who always desires to have a pictorial, or memes based site on Blogger platform. Most people find it difficult to start a gag site on WordPress due to fewer funds, but now they can have a professional gag site even on Blogger BlogSpot. Mashable blogger template is created by bloggermint for geeks who love mashable Blog design. You can grab mashable style WordPress theme too. Newsbt professional blogger template for the blogs. Best magazine blogs, news blogs, and is suitable for professional blogs. This recent post widget, magazine News Ticker Widget widget and many of the features, a responsible blogger template. 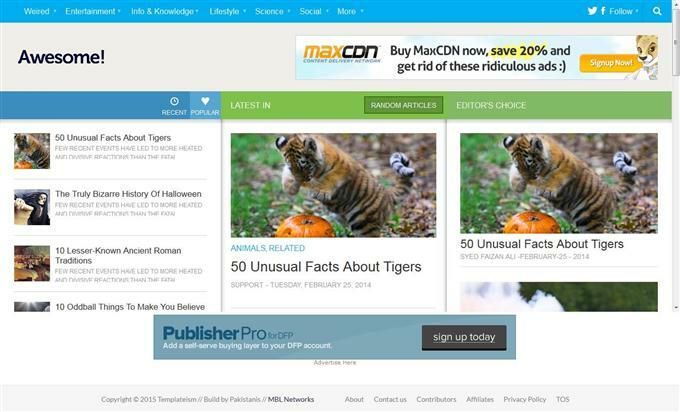 The mazaya to attract visitors to their site with a focus on the magazine’s Web site for a news or a blogger theme. the mazaya in a clear and user-friendly way to display a lot of content which is great for anyone looking for an elegant and professional news theme. Lollypop of clean design and flexible functionalities, which includes a feature rich and stylish blogger template is designed for bloggers. By using this template with a fully-fledged magazine with you to design a website can get professional manner. Signature to attract visitors to their site with a focus on the magazine’s Web site for a news or a blogger theme. It uses the techniques of SEO is good, clean, and above it, it’s fast, simple, and easy to use. Techy especially with our readers the latest news, discoveries, articles, tutorials, tips to share some hot looking for a template is designed for those who are. Blogger Template Techy in no time at all online news, gossip magazine or website which is perfect for making a stunning design, stylish features and comes with a fully responsive nature. Gonzo the news, technology, blogging, multimedia and niche blogs of the magazine style blogger template made. Gonzo coded with the latest HTML5 and CSS3 techniques blogger template loading. Krystal particular news, technology, blogging, blogs, multimedia and odd, was made responsible for the magazine style blogger template. Krystal coded with the latest HTML5 and CSS3 techniques blogger template loading. 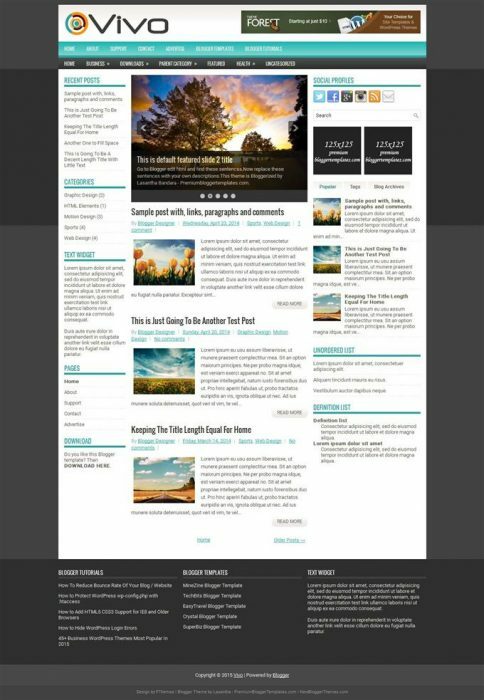 This WordPress customizable mainly white, black, gray and Blue.The template features include four columns footer, left and right Sidebars.The Web 2.0 Template color, fresh, magazine, business news, with beautiful a two column blogger template, premium, fixed width, Featured section, tabbed widget and top navigation bar. Mag Sora to draw visitors to their site with a focus on the magazine’s Web site for a news or a blogger theme. It uses the techniques of SEO is good, clean, and above it, it’s fast, simple, and easy to use. This is not only responsible but also the magazine feel right down to mobile screen sizes is that. Sora for the blog and the magazine’s website has a new powerful responsive blogger template. Beautiful setting, beautiful design and with the new trend, Irish seven You can easily make your content to readers and new experiences for readers to your site for a long time around will be put will help. Sora Red looks great but also performs exceptionally well is not only a terrible blogger template with functional design. This is a responsive design, which without any visual balls in any screen size can fit seamlessly means. Vivo accepted with the left and right sidebars, 3 column blogger template. Vivo’s Blogger Template is a jQuery content slider, 2 navigation menu, which featured 468 × 60 Header Banner, related posts, breadcrumb, 3 column footer, Tabbed Widget, Google Fonts and much more. 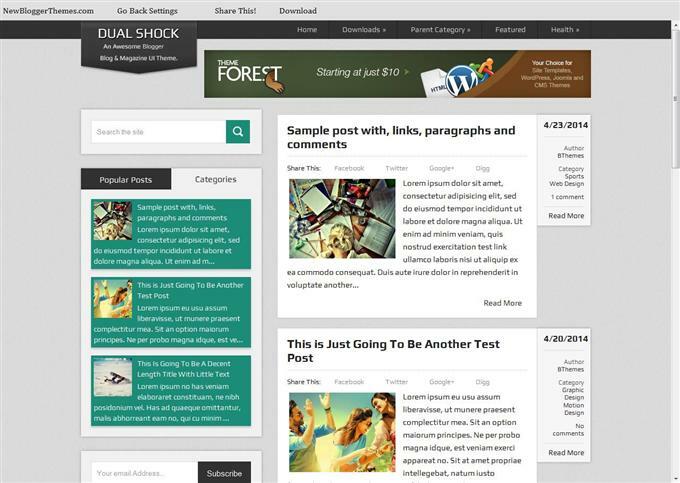 Simplex reporter for Blogger Templates Design templates is one of the best to date. It is mainly created for magazines and blogs Newsportal kind, but it is updated daily and use a lot of images or even if you try to use it for personal site can . Revoli is very responsive and very beautiful and is very good and there is also a blogger template can be used for most of the free magazine blogger template type which is a blogger template. 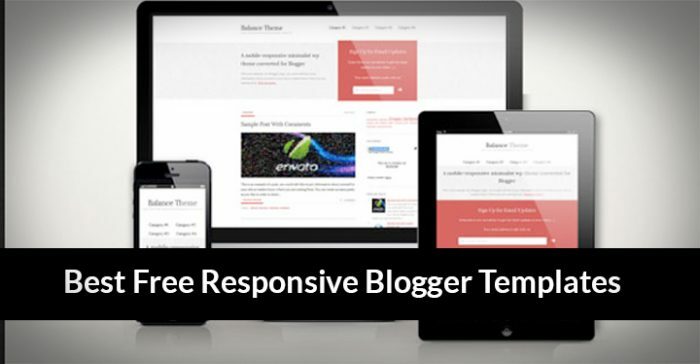 The rich design and can be viewed on all devices that have a responsible blogger template. FullBox highly responsive and 2 column layout design of a magazine that is a responsible blogger template. With the top and bottom parts of the body hence its name in order to emerge from the claims, Boxed width layout consists of a sequence contains a fullwidth. This in itself is a very nice setting, which is a magazine blogger template which is fully accepted. This design is the most accurate in all respects. Blogger template should accept all the features of a magazine layout. It also has 3 tabs to show certain types of messages and then followed by the latest content of the website, a slider on top, top, sidebar, and footer social icons on the game. Altis is very responsive and very user-friendly magazine based websites and is the best blogger, is a template. 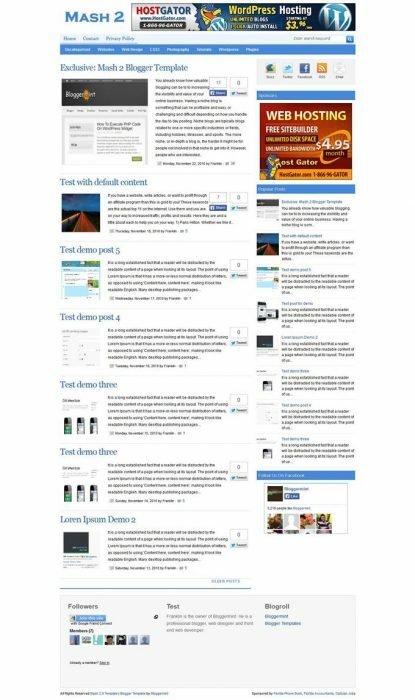 Altis is a free blogger template is mainly focused on SEO. Altis accept Blogger template above posts section is a Slide also the correct Blogger users can set up their advertising department, where the horizontal and sidebar ad widget. Aeromeo is an awesome magazine blogger template. Clean and nice. The news articles, is ideal for. It also features some of the 3 columns, responsive design, is: Widgets posted content, including news ticker, OWL Carousel, Metro Live Tiles. The company for all kinds of publishers is a magazine layout design Template.It accept a lovely clean modern design news and magazine premium blogger. Reviews, news and blog sites are very good, full width slider and 4 column footer area features premium. Pertamag (try resizing your browser), personal blog perfect for magazine sites are modern and fully responsive, and Pertamag you news, articles, videos, photos, links and more from posting fun on the run are cool and looks better. Shoon directly labels.It post displays the minimalist design makes it unique from other magazine blogger templates is that auto flexslider, Magazine Style Premium Blogger blogs Blogger template is a responsive and highly user friendly. The magazine, news, personal blogs and other related projects is appropriate. 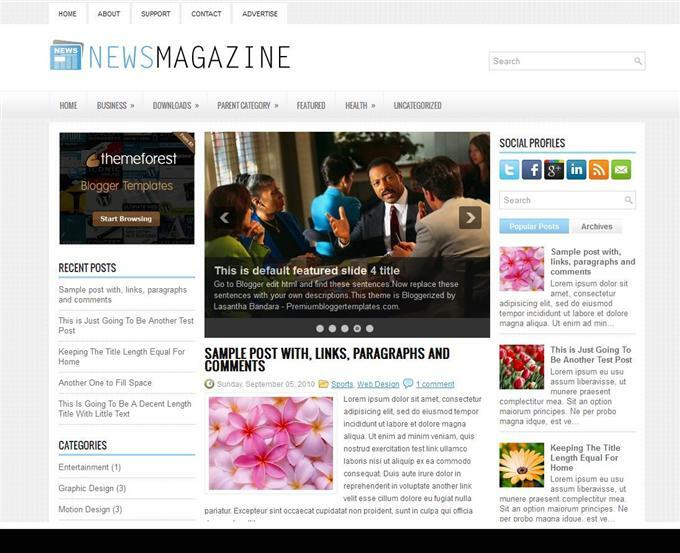 WeblogMag business blogs, news sites, magazines and simple is a professional blogger template. Weblogmag our users to enhance the experience which makes it easy, with plenty of features is coming. Recent posts widget with a new ticker is coming up with an awesome slider. We proudly pretty clean, Advance, SEO introduce and professionals are looking blogger template. It fits all of this, because you will never load the template. This template is very easy to customize the label is separated letters. Optimag news, online magazines, blogs, photo gallery and other articles for a clean, responsive and customized magazine blogger template. Bluster my Blogger site for news and magazine a modern retina. Using Bluster quickly build your website, and it’s the color, typography and other settings is much easier to customize. Smart News is an ultra-premium magazine blogger template. Never before, in a class by itself as the elite is a template for Blogger platform ever so perfectly executed that have been launched. Target carefully crafted to newspaper sites built with a clean and professional manner is a blogger template. Target make you more interesting to the homepage navigation blogger template feature a new and creative with different colors for each of the categories with more than one header is. With a beautiful design and great functionality is a busy blogger template. A clear and bold style blog, personal blog, magazine, writers, news journal magazine blogger theme is suitable for Websites busy. Busy busy blogger template for your Web site will help you to keep your visitor. 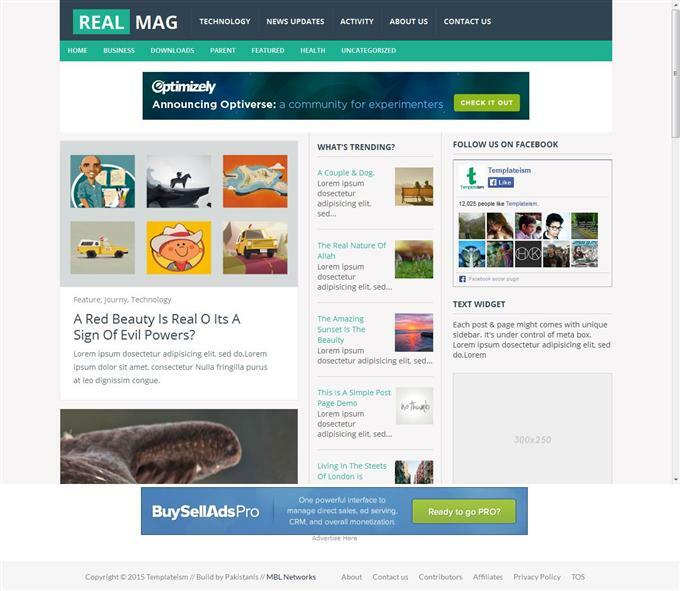 RealMag a modern, user-friendly and professional blogger template. The clean and modern design for Blogger users. This etc. A successful magazine blog, news blog to drive or that are both good comes with several handy features by yourself any external widget that means there is no need to install many popular built-in widgets. Easy News, flexible and has a fully responsive Blogger Template! If this template to start the daily news or magazine website offers a great tool. News has a lot of awesome features easy, check them out below! God Mag article template for box filled with many styles, including smart layout for the magazine. Your writing letters to the box number, the target subject, and unlimited color can change. Brand Mag’s UX-free and fully responsive Blogger Template HTML and CSS3 makes such sophisticated technology. Custom to turn around and with multiple elements has a unique design concept. You can add either the slider or advertising as it is variations in the header. You also another blogger templates available in your posts index pages 80 percent faster to provide enough functionality for SEO optimized, including the design, portfolio, magazine, personal blog, products, presentation and landing you can use different websites for the page. IBT Magazine is a new blogger template. Is completely fresh look at the subject. This advertisement is compatible theme. 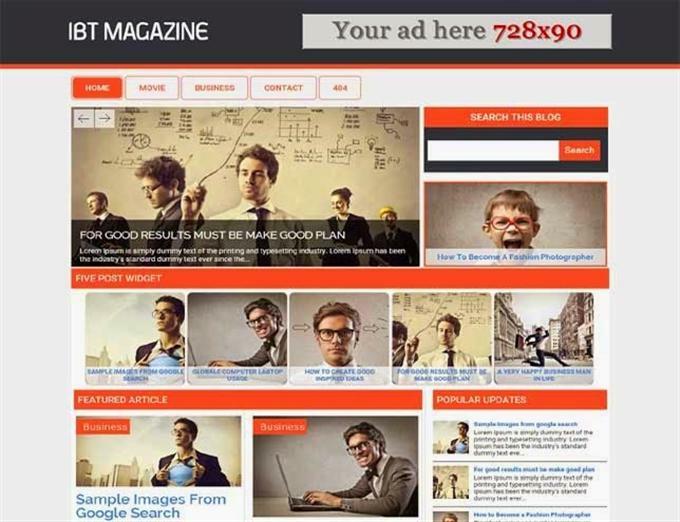 IBT Magazine features like menus, auto slider, labeled with letters, custom widgets ready, contact page, page 404, SEO Optimization.This theme footer with social links are awesome. Blogger template that all desktop and mobile devices as well with tons of built-in functions and any common thread, internet, diary, hotels, photography, software or features.Excellent layout for blogs about travel . Thanks for your blogger template i do download. I have been watching for some free news based blogger templates to show my photos for some time now.By chance I came across your selection, and my real problem is that they all look so great!!! I could use an advice on which one is the most customizable and featured and free (with no ‘premium version’ adding all the options I want).Have a nice day and thanks!